How long to leave off-topic comments visible? Discussion regarding whether PO is only meant to be a site for mainstream physics. @Dilaton 1) "mainstream": can you define this term? Would special and general relativity have been allowed in a mainstream forum according to your definition? May a breakthrough be mainstream? 2) "high level": No offense, please, do you honestly think that you, Dilaton, are prepared to decide whether a question is a serious high-level question or it's nonsense? This is regardless of your highest degree of education or your professional position, it is about your knowledge. And, I repeat, no offense. @drake PO practice shows that it is Dilaton and dimesnion10 who immediately decide what is mainstream, what is high-level, and what is serious. As I said some time ago, they are too self-confident youngsters who do not actually qualify to do this. That is why there are non resolved conflicts with offended users. @drake Dilaton's comment above can be considered to be his vision for the site, rather than a rule. At least that's how I interpret it. Crackpot stuff is handled well by downvotes, not by moderation. 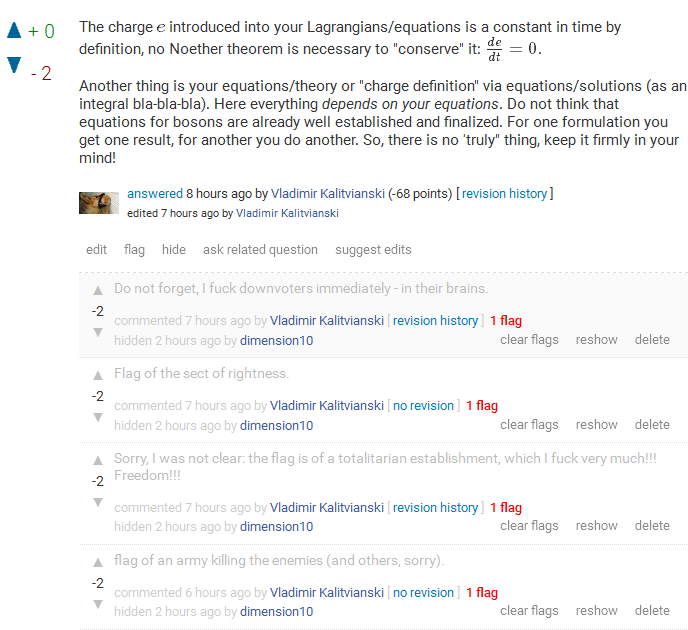 @VladimirKalitvianski the only recent moderator action against you was me deleting some comments of yours. Here are the comments, in case you consider them to be valuable. @dimension10 And how Dilaton's practice "can be considered"? And yours? @ArnoldNeumaier 1) In my opinion you moderators are protecting each other just because you are moderators and I am not. Is this a real answer to the question regardless of if it says "violated" or "changed"? Where are the arguments? Why does he say it has not been changed when nobody has asked that? There are only two possibilities as far as I can see, namely, either I ( the OP) am wrong, that is, I am misunderstanding the policy or the policy has been violated. One moderator has already claimed that he has violated the policy (perhaps arguably for a good reason). 2) Have you though about the ethical implication of editing anyone else's words? Even if they are hostile. One's words describe oneself. I don't know if I was hostile, but what it is true is that this moderator, Dilaton, lied and hided information in the past with the goal of damage an user. He admitted this. And what he did say, that the policy had not been violated, is false. Again. I will always protect the moderators; I did so already before I myself was a moderator. Each moderator is essential for the functioning of PO to an extent a single user never is. Neither are rigid rules essential. In my understanding rules are ethical guidelines to be respected, not laws whose violation is an offence. Your writing of what I edited away is as least as much a violation of the rules of PO as dimension10's liberal interpretation of the ''generally'' in the closing rule. But the right way of dealing with deviations from the ideal guiding principles is not by insisting on right and wrong measured by imperfect rules but by simply undoing what is against a healthy atmosphere on PO for discussing physics. I'm not claiming that what dimension10 did is wrong. It depends on the specific questions being closed without meeting the requirement. What I am saying is that the policy was violated. Perhaps, not such a big deal. ... I am talking about this closevote and the corresponding question. Interesting. I have no access to this, but I wonder what it was. @VladimirKalitivianski: "a stinky place to be avoided" - Then avoid it, please! But you seem to enjoy to be here and make derogatory remarks. If you would open a meta question about your (or someone else's) treatment here, it would belong to ConflictResolution and be moved there. As long as you are only complaining in comments, nothing happens. @Dilaton @dimension10 @ArnoldNeumaier Do not make PO a stinky place! It's an order! @ArnoldNeumaier I see that you allow yourself to be hostile. "the others" lol You also have the privilege to speak in the name of every one else! You have a good weekend, Arnold.